Eurocom is launching an upgrade zone for laptop component upgrades. Now customers have an easy location to transform ones laptops into a high performance new system. 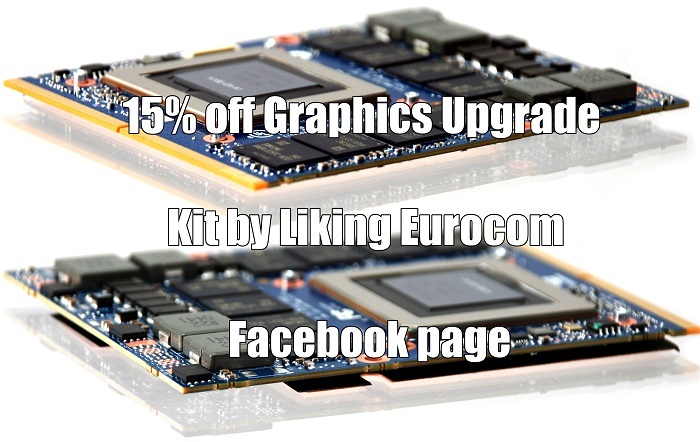 To celebrate we are offering 15% discount on any Graphics Upgrade Kit this July by liking the Eurocom Facebook page. From July 8-15, 2016 anyone who likes the Eurocom Facebook page (https://www.facebook.com/EurocomTechnology/) is eligible for 15% off any Graphics Card upgrade kit for any supported laptop. If you already LIKE Eurocom on Facebook you are already eligible for this promotion. Eurocom upgrade experts are tirelessly testing and verifying new systems and new components to give our customers as many upgrade options as possible. Many laptops are equipped with MXM graphics that can allow for a quick and easy graphics card upgrade to being the performance of your laptop up to modern standards with the most up to date technology. We supply upgrade videos, upgrade guides and also provide an upgrade service where our experts upgrade your laptop for you. Ship your system to Eurocom, we upgrade it, test it and then send it back to you. Eurocom provides everything for an easy upgrade including the X-bracket, screws, thermal pads, and thermal paste and can provide heatsinks that may be needed to handle a new graphics card. “Breathe the life back into your laptop with the performance of a Eurocom Graphics Card upgrade kit” Mark Bialic, Eurocom President. a.	I liked Eurocom on Facebook!